Memory is a major player in the Fermilab project to produce the final focus quadrupole magnets for the interaction region of the Large Hadron Collider at CERN, the European Particle Physics Laboratory. At the project scale, the lab is calling on the irreplaceable memory of physicists, engineers and technicians who helped build magnets for the Tevatron some 20 years ago at a time when Fermilab was the world leader in superconducting magnet technology and production. With the LHC magnets moving through model and prototype and now into the production stage, these veterans and the process itself are also instilling an invaluable quality of institutional memory into physicists, engineers and technicians who are relatively new to the lab and new to building superconducting magnets here. As US/LHC collaboration project manager Jim Strait has said, reviving Fermilab's leadership in superconducting magnet development is "important for the lab's long-range health and for the future of high-energy physics." At the individual magnet scale, memory is crucial to the very quality of superconductivity itself. A magnet is literally trained to remember its superconducting temperature range, and the best magnet is the one with the best memory. "The question is whether a magnet is going to remember its training, or whether it's going to be a bad student and have to start the training again," said Mike Lamm of the Development and Testing Department of the lab's Technical Division. Lamm specifically oversees the electrical connections when the magnets are assembled, but Fermilab LHC project manager Jim Kerby describes Lamm as the project's unofficial senior scientist. A magnet's training revolves around quenching, one of those particle physics terms that means close to the opposite of its usage in everyday language. Quenching a thirst is a satisfying experience. But quenching a superconducting magnet makes it resistive and wipes out its superconductivity. During operation, a superconducting magnet begins to quench when a small area begins to resist current flow and generates heat. "The rate of heat generation is equal to current squared times resistance, just like a light bulb," Lamm explained. The heat spreads to the rest of the magnet, leading to a wholesale loss of superconductivity, abruptly ramping down the electrical current and unleashing the energy stored within the magnet. "A quench can be a pretty violent thing," Lamm said. "You want to avoid having this happen in an accelerator. The accelerator will go down for at least an houróand possibly for many hours." In training, a magnet is first cooled to its superconducting temperature of 1.9 Kelvins (1.9 degrees centigrade above absolute zero) with liquid helium, then electric current is run through its coils to generate the magnetic field. Essentially, magnetic field is directly proportional to current. The LHC magnets have a target current of about 12,500 amperes for their quench point, corresponding to a field gradient of about 220 Tesla per meteróproviding a margin beyond the CERN design specification of 214 T/m. After cooling to 1.9 Kelvins, a magnet is subjected to several quenchings until it reaches an acceptably high current and field. Each quench event takes an hour or more for recovery, with the cryogenic system dispersing the heat released into the magnet and the liquid helium. "A magnet may quench at too low a level the first time," Lamm said. "But it will actually perform better with subsequent quenches, and this is what's called training. One of the main reasons for a quench is that the cable is in an unstable mechanical arrangement. No matter how carefully the cable is wound and cured, there often seems to be a weak point. The force on the cable varies as the square of the current, so it's going to move around if it's unstable." But as Lamm explained, quenching usually acts to settle the cable into a more stable state, in effect correcting the defect. "So the next time you ramp up the current, you don't have this same weak spot," Lamm said. "You're able to get to a higher current next time. Then it quenches there and fixes itselfóusually. Eventually, you get to a plateau where there isn't any further improvement. You hope this plateau occurs beyond the level where the magnet will be asked to perform." The magnet has remained at cryogenic temperatures through the quenchings. The next step is warming the entire magnet and cryogenic system to room temperature, then re-cooling to 1.9 Kelvins. Going from cryogenic temperature to room temperature and back to cryogenic temperature is called a "thermal cycle." Now another quenching is staged. If the magnet achieves a current beyond the target set for operating the accelerator, the magnet passes the test. As Lamm said, it has a good memory. Five of the eight model magnets (about one-third the length of the full-sized prototype) passed their training tests. 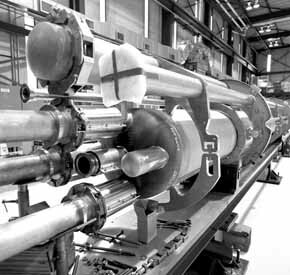 Construction and testing of the first full-length prototype magnet went so well that the Fermilab LHC project proceeded directly to the first production magnet instead of building a second prototype as planned. Skipping the second prototype saved the time and money that would have gone into the additional instrumentation used to measure its dimensions and performance, instrumentation not used in production magnets. The first production magnet is about half-completed, with coils and collars affixed. Over the next three years, Fermilab will build 18 production magnets, jacket them with the cryostat container to hold the liquid helium, and send them to CERN. It's actually a three-way relay. Fermilab will build nine of the magnets onsite (each magnet consisting of two sections, connected by a corrector magnet supplied by CERN), and assemble the cryostats around nine more magnets supplied by Japan's KEK laboratory. The completed magnets then go to CERN for installation in the collider. "We're devoting a lot of effort to keeping track of all the components coming from different places," said Phil Schlabach of Technical Division-Development and Test, whose specialty is magnetic field measurements. "We're hoping we don't have a situation where a lead from one lab won't fit a connector from another. But our situation is actually far less complicated than detector collaborations face, and they do it all the time." The Fermilab LHC effort has fostered the expansion of the lab's magnet production capabilities, combining equipment used in building the Tevatron with tooling inherited from the ill-fated SSC, adding new facilities built for these magnets and for magnets still to come on future projects. As always, people are the primary resource. "Five years ago, we had a small number of people who remembered building superconducting magnets, before we went out of that business when the SSC fell through," said Rodger Bossert of the Technical Division's Engineering and Fabrication team. "But we were lucky to have that core of people who had been around since the Tevatron days and from the SSC. The technicians were probably the most important. They really had their hands on the process and knew how these magnets were assembled. Peter Limon [Head of the Technical Division] had to put together a new superconducting magnet team. He hired a lot of young people who will learn and carry on the program. Now we have the ability to build superconducting magnets again and move back to the forefront of the technology." From start to finish, it's a project to remember.